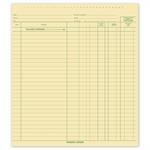 5Forms Business Checks & Forms > Business Checks > 111022N General Data Entry Journal 18 x 11"
Need a second copy of your journal sheet? Simply insert one of these duplicate sheets under your original to capture all vital information. Compatible with 111021N General Expense Journal for One Writes. Compatible with 112031N Vendor Ledger. Compatible with 101000N Standard Vinyl Board, 11 x 12 1/2". 111021N General Expense Journal for One Writes 25 3/8 x 11"
$15.96 111022N General Data Entry Journal 18 x 11"